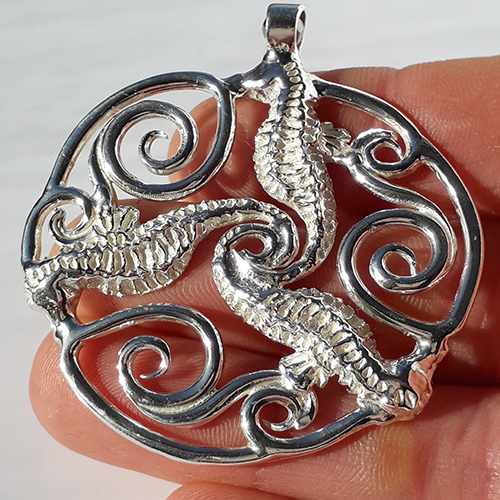 This is a solid silver seahorse celtic inspired design. 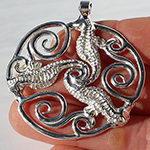 Pa-pa has developed her love of the Welsh triskelion design to incorperate three solid silver seahorses with their tails entwined. This limited edition modern celtic inspired design combines flowing curls and wave forms linking the seahorses together. This pendant which can hang on leather or on a solid silver chain, has been sculpted, filed, shaped and soldered by the hand of Gower's Welsh silversmith Pa-pa.
Pendant measuring approx 6cm diameter.